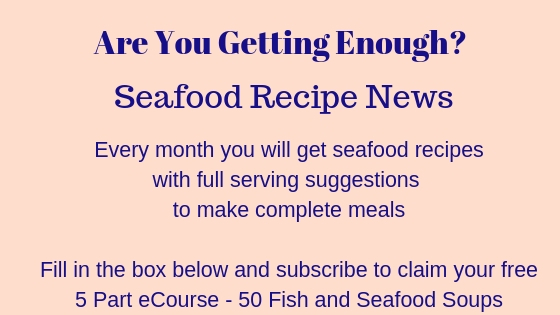 Seven of my best easy seafood recipes is the topic for this month's issue of Seafood Recipe News. These are so simple, you could even let your kids make them with a bit of supervision. I've got a good balance of great dinner party recipes as well as family meals. None of them have huge lists of ingredients and all of them are adaptable for any fish you like. You could even use your catch of the day for most of them. Fish is so versatile - you just need to get into the habit of buying and using it. This easy one dish baked salmon is simplicity itself - seriously, you probably don't even need to read the method! As you can see, you literally put everything in one tray and bake it. The choice of vegetables is yours - I like to tuck a sprig of dill in there too. Part cook the potatoes as they don't take as long as everything else. Excellent as a dinner party dish but if you substitute cod, haddock or a cheaper white fish, then absolutely great for a family meal too. This is simplicity itself and tastes divine. Smoked Haddock cooked in milk - yep, you read that right - cooked in milk. The idea is that you use lots of bread and butter to mop up the juices that are produced here. It's one of my all time best, quick teas. It takes literally six minutes to cook, so get your bread and butter ready before you start. 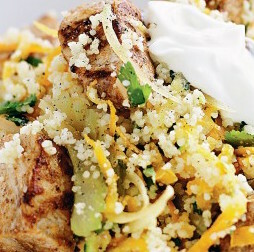 Oh - this is so easy - Fish Couscous. You literally stir vegetable stock into the couscous, leave it to swell up and then stir the fish into the couscous. You can fancy it up with some fried onions and a tin of chickpeas if you like. Any fish will do here. Leftover fish, fresh that you cook whilst the couscous is softening, canned or frozen. The choice is yours and you can choose to suit your budget. Great for a picnic or part of a buffet - less than 10 minutes to prepare. This healthy Fish Stew is a one pot dish - lovely, less washing up! 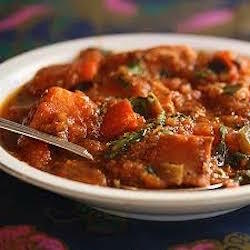 You can serve it with some crusty bread to mop up the gorgeous juices. 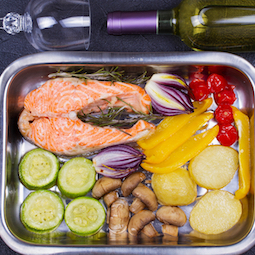 Cook the vegetables first and put the fish in for the last few minutes - this is ideal for a camping meal, to use your catch of the day as it can be cooked on one ring. 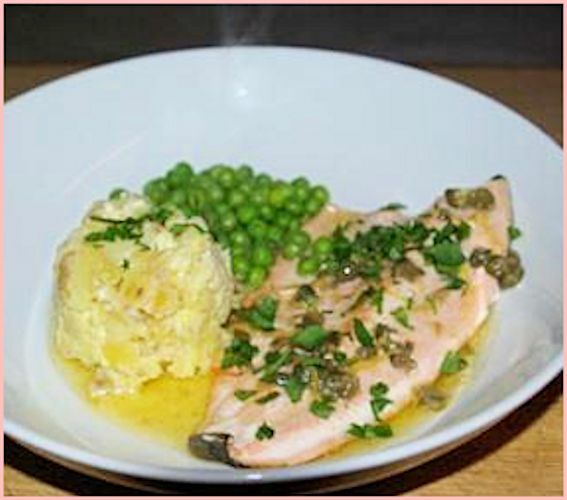 I know you won't believe me when I say this is an Easy Trout Recipe - I promise you, this will be on the table in around 20 minutes - the main time will be waiting for the potatoes to cook! 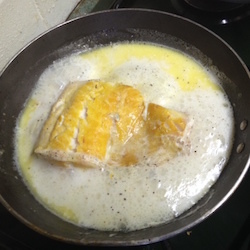 The first recipe is for Pan Fried Trout - which is what this is, with the addition of a little something extra. The link for the potato side is there too - with some buttered peas or other green vegetable, you've got a spectacular and tasty main course fit for a dinner party. 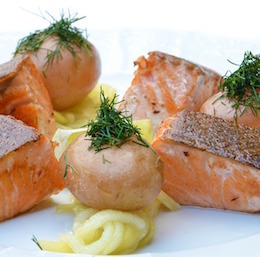 The easiest and most reliable method of Poaching Salmon - works every time, no matter whether you're cooking a four ounce fillet or a 3lb whole salmon. All you need is some aluminium foil, oil and seasonings - oh, your piece of salmon as well and some water! The science behind it is explained, but you don't have to know the 'why' to 'do' it successfully. 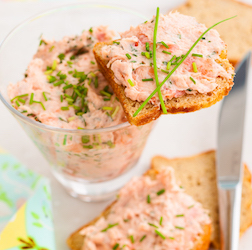 This simple Smoked Fish Pate can be made with trout, salmon, mackerel - any type of smoked fish you like. There are step by step photo instructions to follow. Mackerel is often marked down in our supermarket and you can buy smoked salmon offcuts which are really inexpensive. Use own label cream cheese and you've got a really good value but expensive tasting starter for a special dinner or a lovely snack with hot buttered toast or crusty bread. 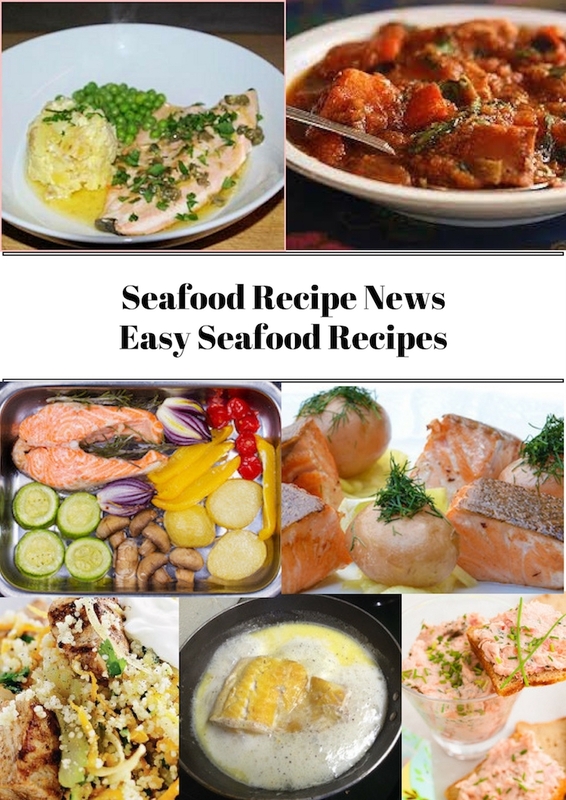 I hope you've enjoyed my 7 best easy seafood recipes - try one or two a week to have some meat free days, it will really help with getting essential oils, minerals and vitamins in your diet.